From disco to disco. Where are you in the 70s? Probably dancing and sweating and screaming on a dance floor while some impromptu dj pushed up the last disco music hits... If you lived somewhere along the Via Emilia, Italy you would have been involved in massive companies moving around after 11pm from their home districts to big and small music clubs built in industrial mass on a limited area. A Boogie Wonderland. Those young people took up the heritage from their parents' traditional ballrooms, though not abandoned yet under the impression of a new generation of people without a precise purpose but to having fun. One question resists: Disco got soul? (Please, don't let me be misunderstood). From disco to download during just three decades. Vinyl disco is dead. Music on tape disappeared. CD is no more sane. DVD, after supporting the commercialization of the best rock movies, is obsolete. Download is the new frontier of consuming digital music, a worldwide market of 4.2 billion US$. The Internet has opened a different way to consume music. The old hit-parade as statistics built on selling data from music stores has been surpassed by the most downloaded songs from iTunes. Who will resist among the pop music stars? How can one stay easy connected to the music industry? Read Billboard's fourth annual countdown of music's highest earners, from U2 to Leonard Cohen, the 40 Top Earners in Music! What? It's the password... www.billboard.com. 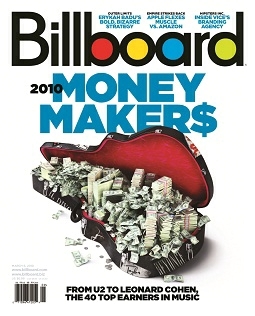 There you will know how Americans like to measure money makers on music business with detailed 2009 earnings from album sales, touring, publishing royalties and streaming. P.S. You ought to change some cards, the result is always N.E.W.$.! Now we are going to sing a different tune. 1983 the Video Music explodes and a new wave of musicians succeed by means of TV promotion and no more thanks to the radio programming of big hits --this trend is also labeled as 'video killed the radio stars'. Your relationship to the MUSIC STARS will be no more the same because all you want is simply discovering what really stands behind her or him... How are they moving, dancing, dressing while performing on the stage? What are their direct message, attitude, style? Let's go to the concert and join other dearly beloved --where you do more than just hear music, you are part of it! Rock No War! Many good musicians fly the flag of American culture (counter-culture? ): since Born in The USA how could it be otherwise? They basically need to talk to their biggest fans on a constant basis, for instance a major rock band have sent regular news to their fans thru an official magazine (Propaganda). There is a term, frequently used in marketing, that sounds as a short song mainly broadcast on radio or tv commercials to promote a brand! What is it? (Find answer on DMLR*News No.49).